Sometimes I just get a bee in my bonnet about a design and nothing will stop the runaway train that is my yearning to knit that thing. You are all makers, you know how this goes. “I already have one of/enough of/no need for that sweater/quilt/blanket” and you go on making dinner or knitting a plain cardigan and hoping it will pass, but guys. It does not. You and I both know it. I saw this pattern a few years ago, promised myself that I didn’t need it, and then pretty much immediately started accumulating the yarn to knit it. Well, whatever. 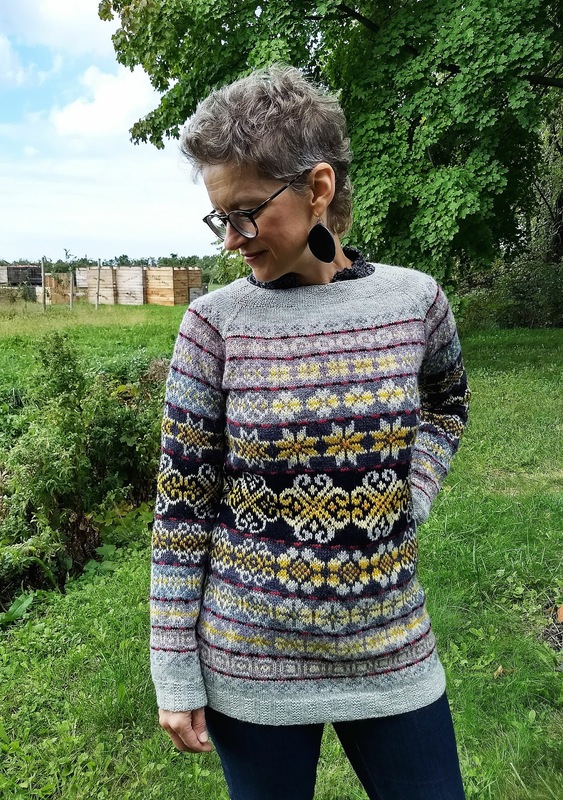 So there’s some Rauma Finull, some KnitPicks Palette, some Elemental Affects, some Holst Supersoft, some Jamieson and Smith, and some Jamieson’s of Shetland all thrown in there together. It worked just fine, and it turns out I have enough of this kind of yarn to make, ahem, a lot more sweaters like this. The first two-thirds of this was terrific fun to make and I woke up early in the morning kind of itching to get back at it, rationing myself to one color band every day and sort of swooning at the emerging beauty of the colors. Then my old (formerly trusty) bamboo dpns gave me a sliver that bugged me for days and by then I was slogging down the sleeves and looking longingly at the bind off. I saw it was getting long [row gauge! Why you gotta be like that?] but once I embraced the idea of it as a tunic, I felt good about it again. Post-blocking, the finished sweater revealed to me that it was too wide as well, so I mattress-stitched up the body sides and undersides of the sleeves and got rid of a little width, which made me feel quite clever. So, it is finished. Is it not splendid? 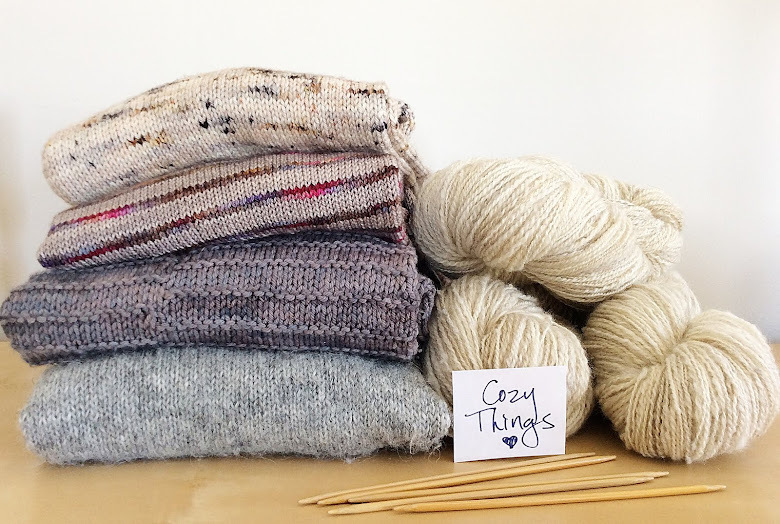 Is it not a testament to a knitter’s love of wool, color, pattern? Is it not a proper freak flag to fly and wear at the next available yarn festival? Yes. It is. Oh for heaven's sake! That is a ridiculously beautiful creation. If it was a book it would win the Man Booker Prize for Outstanding Achievement in any genre! !Have fun at Rhinebeck and have a donut on me! (ps, what is in the crates in the background of the first pic?Apples,perhaps? ).pps Love your earrings too! Oh so beautiful! And it looks really warm. 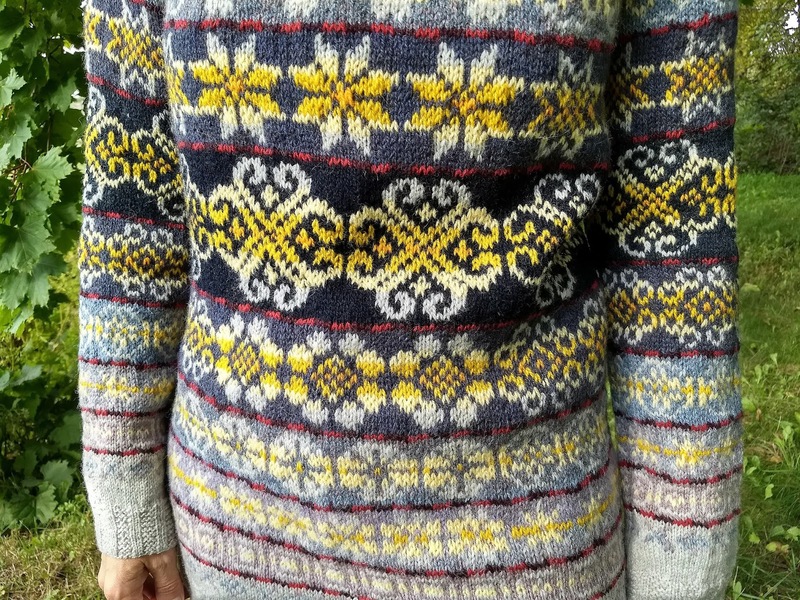 Like your other gray sweaters... this is gorgeous... 'gorgeous squared' actually, its really special!!! Wish I were coming to Rhinebeck again just so I could look for your sweater, to say hello in person and to meet Doc!!! Have a wonderful trip! And happy shopping!!! Absolutely beautiful!!! You are such a superb knitter. I love seeing your projects and each new one is my favorite. First thing out of my mouth was OMG! Fantastic. I would recognize you (your sweater) any where! But sadly will say hello from here and not see you at Rhinebeck. Sniff some yarn for me. have a great time at Rhinebeck! Your sweater is stunning! Enjoy Rhinebeck! LIKE! there's no heart button here, what to do?! haha, love the tunic and the thought of you and Doc in person... alas, i am a West Coaster and don't knit, but cheers anyway, hope you both have a great day Sunday! Sorry to have missed you this year. We thought we might have seen Doc but you weren't near by so we must have been mistaken. We also looked at the donut line and kept on walking but your recommendation puts it high on the list for next year. 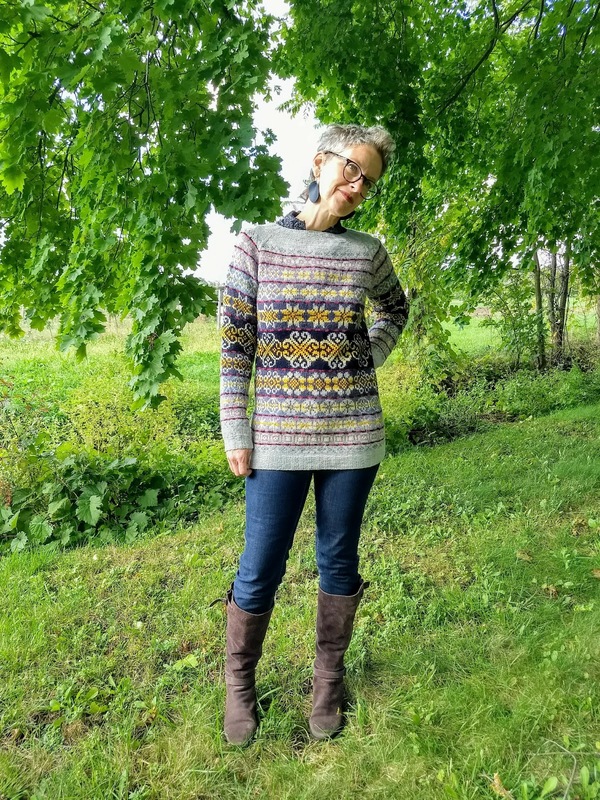 Next year I'm shooting for my own Rhinebeck sweater (instead of Rhinebeck shawl) but I guarantee it will be a lot less fair isle and a lot more basic one color stockinette. But a girl has to start somewhere!